Chocolate chip cookies; a classic comfort food. Who doesn’t love warm, fresh-baked cookies out of the oven? Honestly, they’re probably one of my favorite desserts. Easy to make, fast, small portions AND I usually have all or most of the ingredients in my kitchen. It’s hard to believe that 10 years ago I knew very little about baking cookies from scratch. My love of food has evolved over the past decade into something that borders on an obsession. I was teaching myself how to cook and bake but it wasn’t enough. I wanted to take it to the next level. After a decade of working in an unsatisfying career, I made a major life decision. With both fear and determination, I applied for culinary school. It was a tough journey, but I don’t regret one minute of it. I learned so much while in school. Every dish we prepared was incredible and each day was a new adventure. But now, several years later, the recipes I return to again and again are the simple ones such as these chocolate chip cookies. I truly believe they’re the best. We were often told in school not to change any of the recipes. That they were perfected by classically trained chefs and we couldn’t possibly improve them. Well, I think that remains up for debate but I always make these cookies exactly how we made them in school. They’re that good. Yes, you can swap out the shortening for butter. But follow the recipe below as written and you won’t be disappointed. Sift or whisk the flour, baking powder and salt together. In a stand mixer with the paddle attachment, combine the vegetable shortening and butter. Add the sugar and brown sugar. Cream until light and fluffy, approximately 5 minutes. Add the yolks and the eggs on low speed, one at a time. Scrape down the sides and then slowly add the flour and vanilla. Mix until just combined. Add the chocolate chips and chopped chocolate. Mix on low until just combined. Use a small ice cream scoop to portion out the cookies. Chill for at least 15 minutes. Bake at 350 for 13-15 minutes, or until just brown around the edges. I love Jen from Savory Simple! She’s so talented & fun. Happy that I got to meet you both at EWR12! @the wicked noodle – I’m so glad I got to meet both of you too! I hope we’ll run into each other at another conference sometime soon! 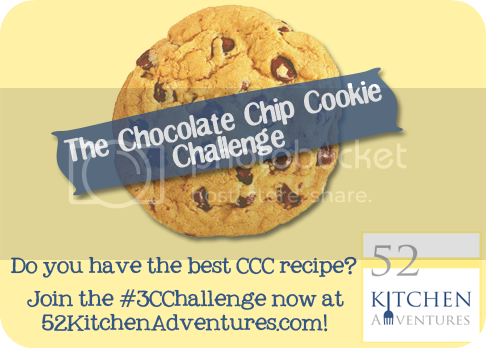 I think the combo of chocolate chips with chopped chocolate totally makes these cookies! These look great. It’s always great to have classics to rely on, but I do also think it can be very important to keep pushing oneself to improve and create new things.